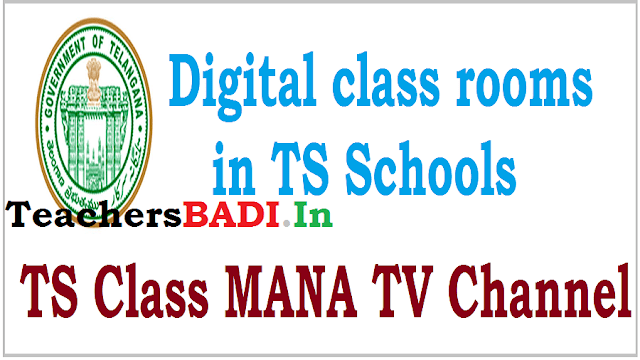 Digital class rooms/Digi classes/Digi lessons through TS Class MANA TV Programme in TS Schools from 16/11/2016: TS Class Programme, TS Class Channel through Mana TV, Digital classes, digital lessons, Digital Content Hard disk for TS High Schools. MANA TV Programmes for TS Schools. Telangana government would introduce digital classrooms in the first phase in 1,500 schools from November 16. The digital classrooms are being introduced as part of the government’s resolve to improve quality of education. The state government would also set up computer labs in schools. About SoFTNET: Society for Telangana State Network (SoFTNET) is a satellite based communication network under IT E&C Department of Government of Telangana - runs two channels by name Mana TV. The channels are being utilized for Distance Education, Human Resource Development and e-Governance among others. In a move that will benefit large number of students in government ts high schools and TS govr has introduced digital schools in Telangana. Students from class 6 to class 10 will be taught in digital classes. The digital classrooms will function in two methods. In the first method under Mana TV programme the classes will be live telecast from Hyderabad which will be directly shown on the screen. In the second method schools will be supplied with pre-recorded audio-visual material fixed in a hard disc. While the telecast of digital classes will continue under Mana TV programme, teachers will run the programme under second method. Some of the teachers were selected and trained for this purpose. It was stated that the digital classes will be more self-explanatory and make the students get acquainted with the new technology and keep them on par with students in private schools. Digital classes through ROTs: Daily 4 different subjects programmes will be telecasted through TS Class MANA TV Programme. We will also receive live channels through Youtube. Sub: RMSA, Telangana Hyderabad - Launching digital class rooms in the Secondary Schools under Govt. Management on 16.11.2016 at 10.00 AM through MANA TV (SOFTNET) by the Hon'ble Dy. CM & Minister for Education, and Hon'ble Minister for ITE & C Govt. of Telangana - Issue of necessary instructions - Reg. Ref: Video Conference with District Collectors, Telangana 09.11.2016. ROTs and hard disks: All the DEOs in the State are hereby informed that, vide ref. cited the status of digital classrooms and functional aspects are ROTs(Receive Only Terminals) have been discussed with District Collectors along with teacher training and providing hard disks with digital content to the schools etc. have been discussed and it was directed to confirm the exact number of schools with digital classrooms (off line) and functional ROTs to received MANA TV Programmes. It was also informed that the launching of digital classrooms will be on 16.11.2016 and requested to conduct trail run of digital classrooms on 11th & 15th November 2016 with the digital content given in the hard disks. Inaugural programme: In this regard it is further informed that the Hon'ble Dy. CM & Minister for Education, and Hon'ble Minister for ITE&C Govt. of Telangana along with Special Chief Secretary Education Department, Secretary ITE&C Department, Director of School Education Telangana will inaugurate the digital classrooms at 10.00 AM from SOFTNET studio (MANA TV). The inaugural programme will start from 10.00 AM onwards on 16.11.2016 followed by subject wise tele lessons till 4.00 PM. Daily 4 different subjects programmes: All the DEOs are requested to inform all the Headmasters of High Schools which are identified for lunching of Digital classes using ROTs and K-YANs to make necessary arrangements in the schools to view the programme. Daily 4 different subjects programmes will be telecasted. The details of topics to be telecasted from 16th to 19th November 2016 is enclosed. The telecasted lessons are planned to facilitate students participations and make it more interactive. This is a suggestive model for transaction of digital lessons from the 1 TB hard disks and also for the regular transaction of curricular subjects in the classrooms. Digital lessons in Digital schools: Further in the digital schools i.e. where computer and LCDs are functional the digital lessons may be screened in the class rooms using the digital content furnished through 1 TB hard disk. All the DEOs are requested to appraise the position to the District Collector and plan the launching of digital class rooms in the Districts. Schedule of MANA TV lessons From 16-19 November 2016.